Most of the panelists were able to speak about their experience with intersectionality - an overlapping of social categorizations like race, gender, and sexuality, that often result in compounded discrimination for an individual. Being a member of two minorities can lead to a confusing relationship with oneself. Mariano is 27, but between being gay and Hispanic, he feels like he’s still grappling with his identity and figuring out how to move around in the world. As an “undetectable” gay person, Mel admitted that she’s a recipient of privilege that many queer people don’t get. When she’s out walking in the world, it’s less likely that she’ll experience discrimination or disadvantages because she can “pass” as straight. But, that privilege also has it’s downsides - like when Mel encounters people who can’t seem to get over the fact that, while she’s gay, she “seems straight”. In the face of these people, she has to reiterate her identity. For non-binary and genderqueer people, reiterated your identity can be a part of daily life. Nina went over the process of teaching people their preferred pronouns - as non-binary people like them don’t just go by the binary he/she him/her, but by they/them or ze/zir. 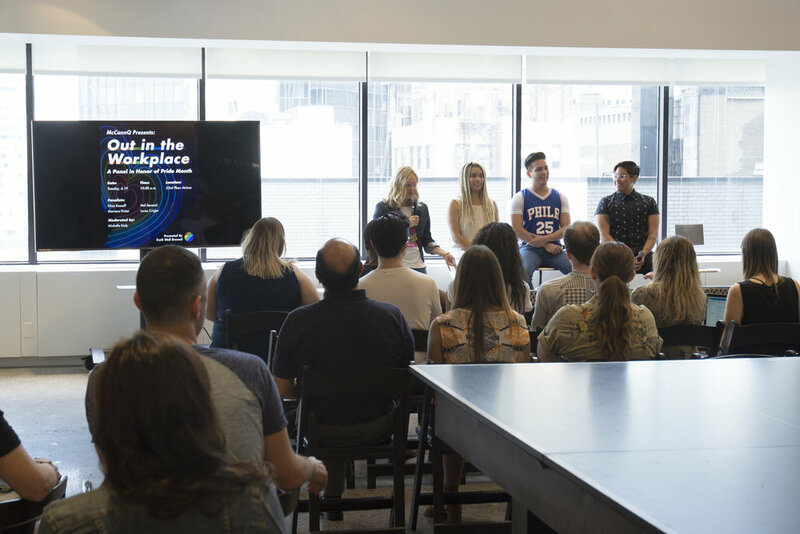 While their experience getting people to use their preferred pronouns at McCann has been positive, they mentioned that they sometimes get pushback from people who think they/their/them is grammatically incorrect when used to refer to a single person. While explaining this over and over may seem like a pain, Nina said that there are benefits to teaching people their preferred pronouns: it gives Nina a chance to see people are paying attention to what they’re saying or not. Lucas, a trans man, had a complicated experience asserting his identity. In elementary school, he had short hair and was naturally masculine, but was bullied for it, so he attempted to look and act more feminine throughout middle school and high school. He came out as a lesbian at 25 and began to express his gender identity with more masculine visual cues. “I had a big truck and two big dogs. I just really felt like I needed to make it obvious that I was masculine.” After beginning hormone replacement therapy and physically transitioning (an experience that not all trans people undergo), Lucas felt that he was able to “pass” as a male and didn’t have the same pressure to cue people into his identity. Misconception: The LGBTQ+ community is one big, happy family. Misconception: Legalized marriage is the end of the fight. Misconception: There is a man and a woman in every relationship. Misconception: It’s ok to ask trans people about what procedures they’ve gotten/plan to get. The general consensus was that the most important thing you can do is show up for your LGBTQ+ friends. Be a shoulder to lean on, an ear to listen, a set of arms to give a nice big bear hug. Being an ally shouldn’t just be limited to how you act around the LGBTQ+ community - in fact, sometimes what you do when a queer person is not around can be even more important. Straight allies are in rooms with other straight people, who might not be as accepting. “If someone says something off-base, you owe it to you them to correct them”, Mariano says. Nina pointed out the slight absurdity of even having to be “out” in the workplace in the first place: “LGBTQ+ is defined by gender and sexuality - rationally, sexuality shouldn’t have anything to do with the workplace. It should be limited to a mention of your girlfriend or partner.” Unfortunately, because humans are crazy curious and far from rational, coming out is a reality most LGBTQ+ employees have to deal with. Thankfully, those who’ve come out at McCann had positive things to say about their experience. Nina recalled coming out as non binary to the entire department before even meeting them. “[Former Head of Strategy] Veda asked me to write a little introductory bio on myself that she could send around to the department on my first day. I just kind of threw in that I prefer the they/them pronouns.” When they stated this for the first time to department heads, Gemma Craven and David Broad, she said they didn’t bat an eye. However, coming out is something most queer people will have to repeat with each new job. Take Lucas, for example, who has had multiple stages of coming out: “I came out as a lesbian at my agency in Rhode Island. I was kind of hoping that they would just catch on.” He came out as trans at his agency in LA, but McCann is his first job where he’s officially known as “Lucas”. As the panel came to an end, it was hard to not be struck by the surrealism of the moment. It’s 2018, we’re at work and we’re steeping in the experience of LGBTQ+ employees who get to live fully and freely each day.